I present to you: My final Houston restaurant blog post from my month and a half-long vegan stint. But first let me say, I sincerely hope that all of you made it through the epic Houston April 2016 flood safe and unscathed. I, for one, could not even get out of my parking garage because my street was flooded, so I had a snow day and stayed in with my favorite boys (Jon, Baxter, and Newton). All of us and our belongings are totally fine, thankfully! 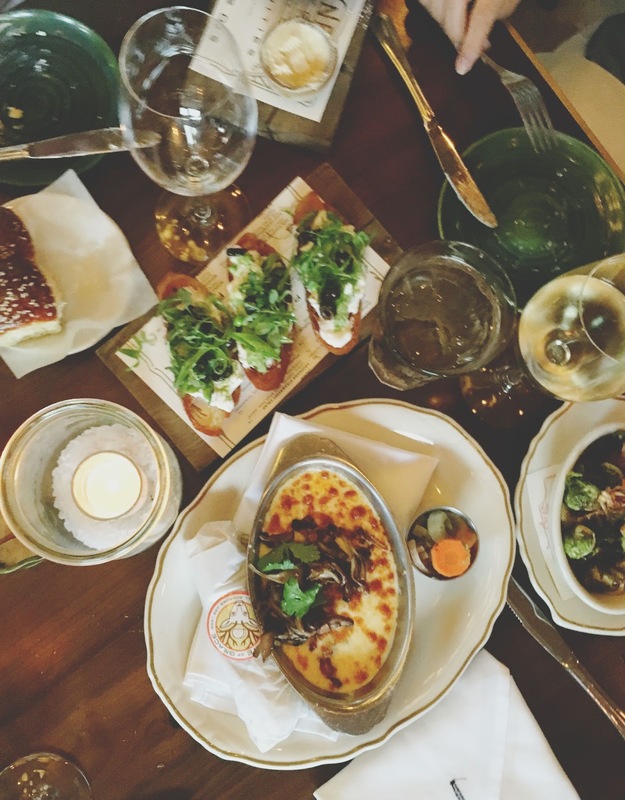 I hesitated to write this restaurant post for a couple of reasons: 1) I don't want to come across as complain-y, and oh, "Poor Kim, she's so sad she's not a vegan anymore," because I assure you that's not the case! I am completely, 100% at peace and happy with my decision to switch back to vegetarian; and 2) I don't want to come across as disliking the restaurant I'm writing about, because on the contrary I actually think it's fantastic! And for that reason, I ultimately decided to write this post. At the end of last month, and at the end of my vegan journey (and not coincidentally, on the last day of my vegan journey), I went to Houston's State of Grace for dinner with my friends Kate, Danielle, and Chelsey. I had been hearing such rave reviews about this restaurant and their food for quite some time, that when I called ahead and was assured they'd be able to accommodate a vegan diet, I was over the moon excited! I started off by ordering one of the restaurant's specialty cocktails, the fresa fresca. This drink is a concoction of pureed Louisiana strawberries, mint, lime, and the diner's choice of one of a few different liquors (I went with Waterloo Antique Barrel Reserve gin). 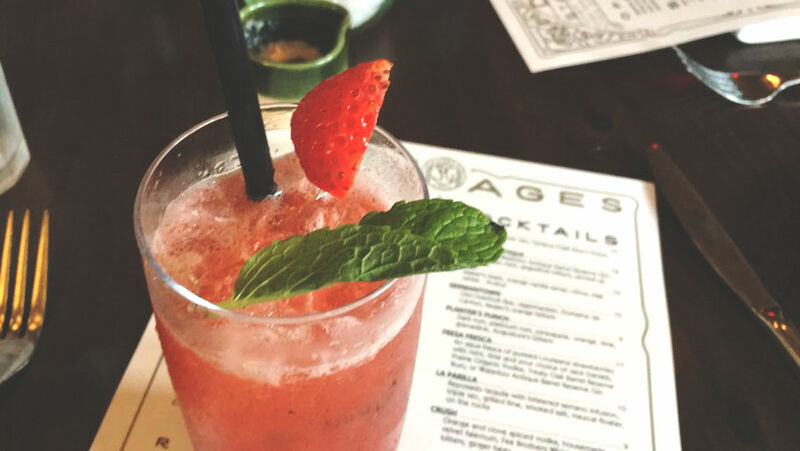 Garnished with a fragrant basil leaf, this slightly slushy drink was subtly sweet and tart, and wonderfully refreshing. 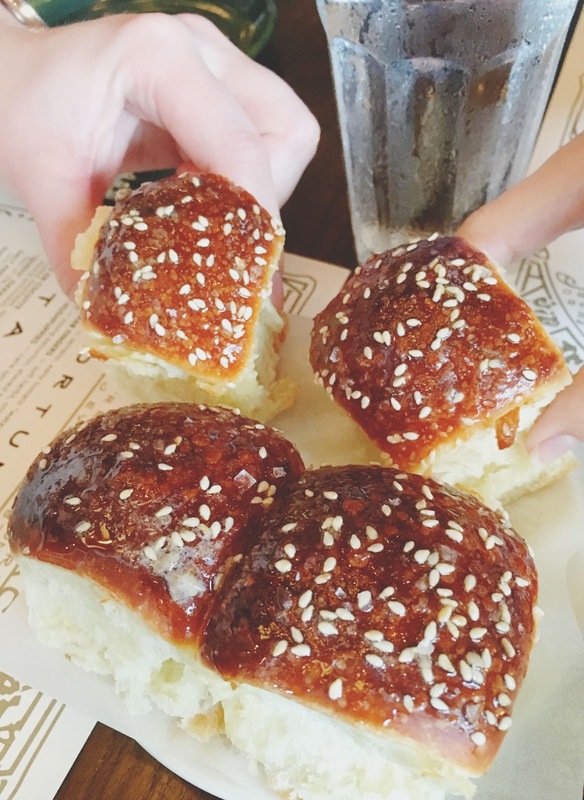 Then we were presented with some beautiful complimentary dinner rolls. Clearly slathered in butter, I tried to grab a piece from below and inside the roll, and it was light and fluffy. Our server enthusiastically gave us an overview of the restaurant's history and the seasonality of the food. He then discussed my options with me. 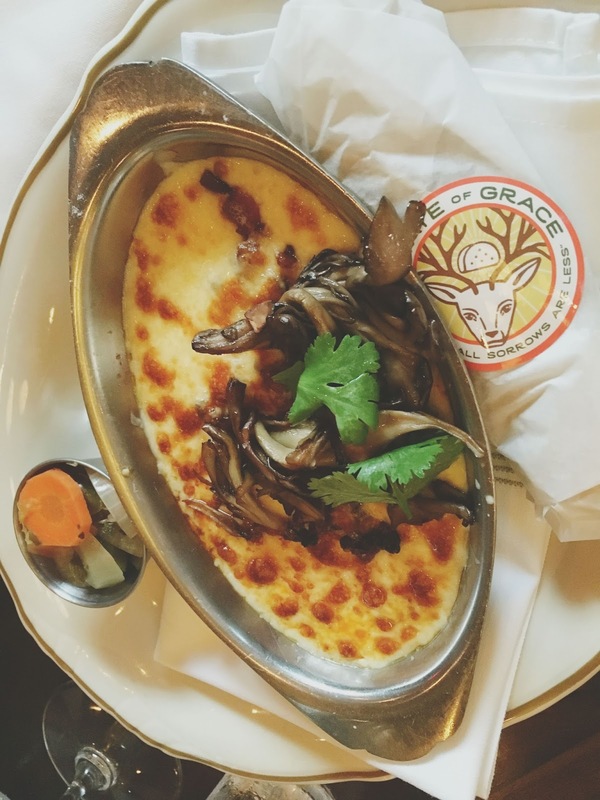 State of Grace's menu is a small but impressive list of unique, southern-inspired items. If I had gone in as a vegetarian, I would have been able to navigate it gracefully, with some minor substitutions. But as a vegan, I'm sure I was looking at it like a deer in headlights. This is the pinnacle moment that began my undoing. <~~(omg could I be more dramatic.) And this was in no way the restaurant's fault, and obviously something that had been percolating in my mind for some time. The server was so totally accommodating, in fact. He asked me what I was in the mood for - I had no idea - and I threw out some vague food terminology (vegetables? pasta? bread?). Needless to say, I got pretty stressed out. But again, the restaurant staff was super helpful, and they brought me an appetizer of the burrata (without the burrata). This dish consisted of sweet pea hummus, cured black olives, and snap peas atop toast, and it was seriously fantastic. 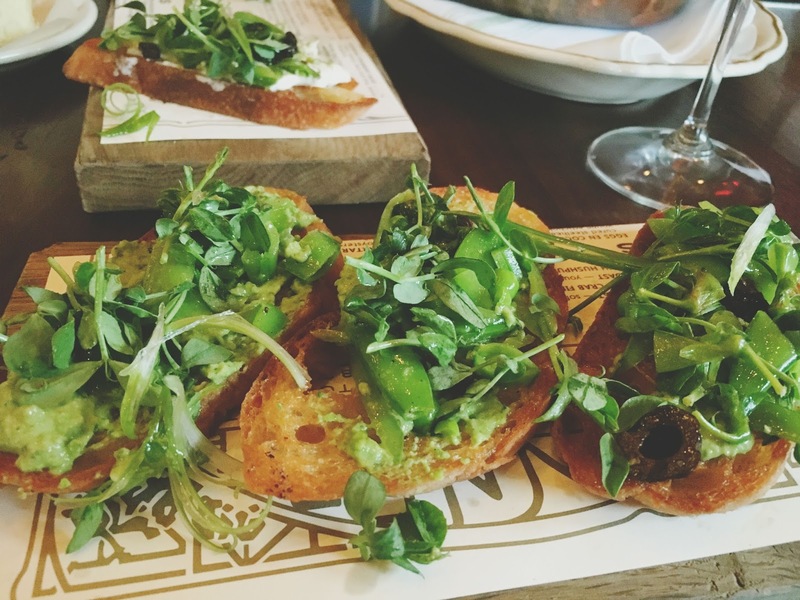 The super crispy toast was crunchy and firm, the snap peas and sprinkling of greens added a wonderful hit of texture, the olives were subtle and welcome, and the sweet pea hummus was out of this world - perfectly salty, creamy, and decadent. Even though my girlfriends ordered the burrata with burrata (like you do), I did not feel like I was missing the cheese at all. This appetizer sufficiently calmed my nerves and gave me significant moments of food-lovin', euphoric pleasure. I'M COMIN' FOR YOU SOON QUESO OAXACA. 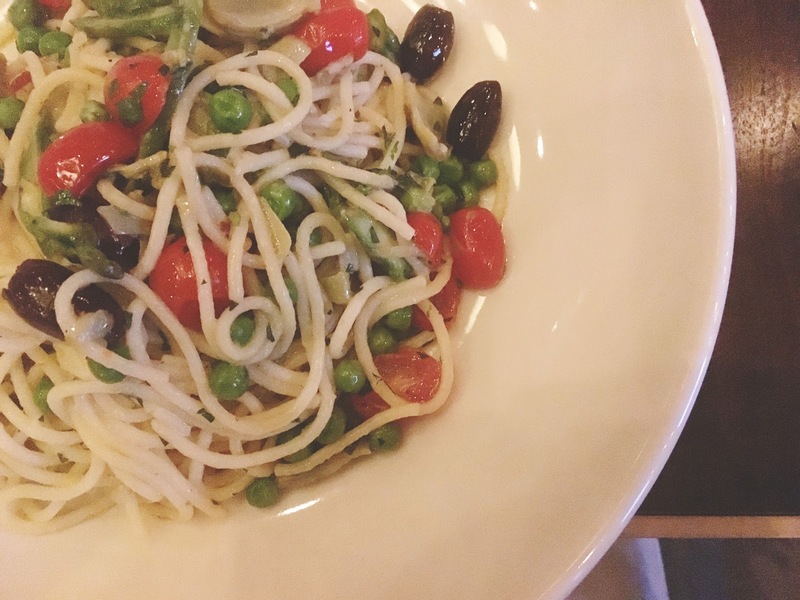 For my final round of food, I was presented with a pasta dish consisting of spaghetti noodles, olive oil, fresh herbs, cherry tomatoes, olives, asparagus, and peas. AKA, spring in a bowl! This dish was also great. It had light, subtle flavors, from the salty olives to the juicy, citrus-y, bursting tomatoes. The textures were also very pleasing, and the end result was a light, yet satisfying dish. So even though State of Grace was - and is - completely accommodating when it comes to stricter diets, it was this meal that was ultimately the turning point for me. On one hand, it is important to me that I live my life as peacefully as possible with all of the creatures of the earth (cue the lighting of the incense); and on the other hand, enjoying time with the people I care about while dining out in Houston is a part of who I am and what I love. If I'm stressed out the whole time over the former, it's hard to execute the latter, so that was how my breaking point came to be. I rarely have had an issue eating out in Houston as a vegetarian, and if I continue to eat mostly vegan/locally sourced/humane certified on my own while dining out as a vegetarian, I am a-okay with switching back to vegetarianism. THUS. 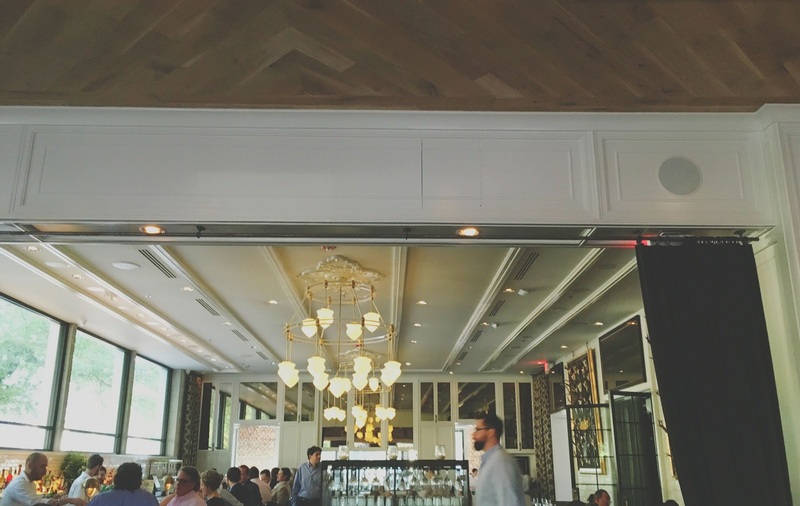 The food at State of Grace was outstanding, AND I cannot wait to go back as a vegetarian. 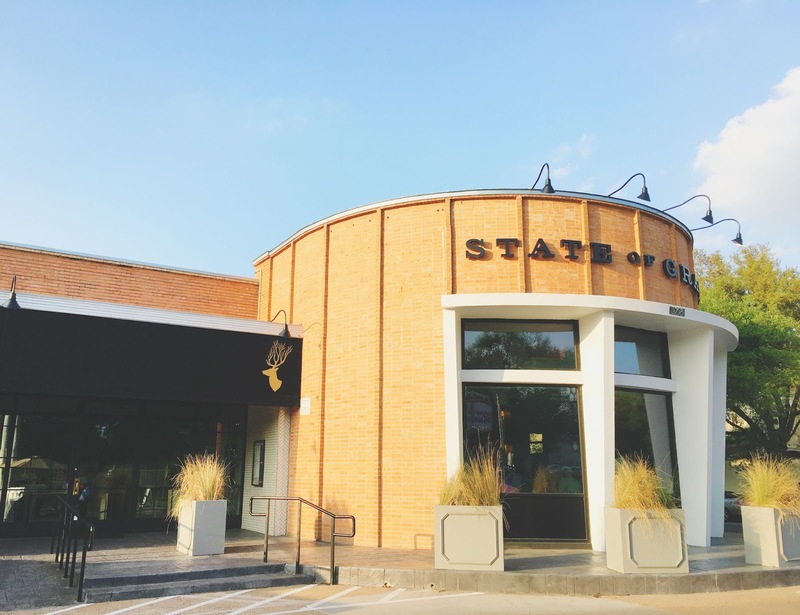 Located in Houston's Upper Kirby/River Oaks area, the atmosphere at State of Grace is lovely, the service is fantastic, and the food I ate that evening was delicious. I really and truly cannot recommend it enough!